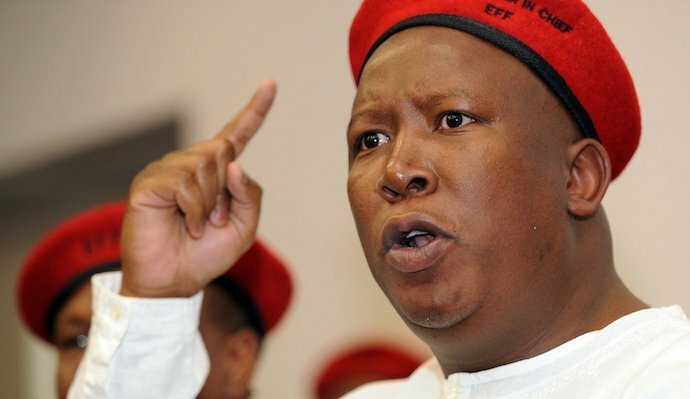 SOUTH African opposition party Economic Freedom Fighters (EFF) leader Julius Malema yesterday slammed President Emmerson Mnangagwa for allegedly “reversing the gains of the revolution”, especially on land and warned that the Zanu PF leader might fail to complete his term of office if disgruntled Zimbabweans decide to turn against him. Malema told journalists in Johannesburg that by offering to compensate white former commercial farmers for land lost during the fast-track land reform programme, Mnangagwa had gone against the spirit of the liberation struggle. Early this week, government tabled a ZWR$53 million part payment for the estimated 4 500 white farmers who lost their farmland in the chaotic land reform programme in 2000 under former President Robert Mugabe. The land was redistributed to over 300 000 new farmers, mostly Zanu PF supporters and war veterans. Finance minister Mthuli Ncube this week announced that farmers would soon start receiving their payments while a full package, amounting to more than $30 billion required for the exercise was being mobilised. But Malema said the ex-farmers did not deserve such compensation. “They do not deserve any compensation. Mnangagwa is a sellout. We thought he was going to bring a fresh air in Zimbabwe, but he is continuing to be worse than what we have experienced before. Very soon, the people of Zimbabwe will turn against them and he won’t have anywhere to run,” he said. Malema’s EFF is pushing South Africa to expropriate land without compensation, arguing that whites grabbed land from blacks without paying for it. But Zanu PF spokesperson Simon Khaya Moyo said Malema had no right to interfere in Zimbabwe’s internal politics. “He (Mnangagwa) is the President of Zimbabwe and he was elected in that position by the people of Zimbabwe. We cannot entertain any comment from people who have no relevance to our political discourse. You don’t interfere in our internal affairs,” he said. Information deputy minister Energy Mutodi last night told NewsDay that the Mnangagwa-led government’s move was meant to mend broken relationships with the Western countries since the land issue was at the centre of Zimbabwe’s fallout with the West. “Government is clearing all obstacles that have hampered cordial and co-operative relations with Britain and the whole European Union bloc. The Second Republic is focusing on re-engagement,” he said. Mutodi said the motive was to win investors’ confidence. “The compensation of the former white farmers is necessary to instil investor confidence. We are implementing a number of reforms that ensure that we create a clear break from the past and lay a firm foundation for investment. That is the (direction) this government has taken,” he said. Government hopes that the compensation offer would help to persuade the United States government to lift sanctions on Zimbabwe. The farmers took their dispute over land dispossession to the Sadc Tribunal, and won, but government in 2011 influenced other regional countries to suspend the tribunal, established in 2005. It was re-instated in 2014 under a new protocol which limited the jurisdiction of the tribunal to only hear cases between member states, such as disputes over water or territory, rather than cases brought by individuals against states, such as human rights violations. Information ministry secretary Ndavaningi Mangwana said government was being guided by the Constitution. “Mr Malema’s comments are ill-informed and they betray a failure to grasp Zimbabwe’s policy regarding land reform,” Mangwana said. The post Malema slams ‘sellout’ ED appeared first on NewsDay Zimbabwe. What does Malema know about a revolution ?? he is still a child. He supports nationalisation of everyting, but is the biggest capitalist. Malema did “Woodwork” as his only subject at school, and failed that. He is unemployable, so just expects everything to be given to him for free. A very dishonest and dishonourable man. Compensate white farmers. Wait and see if investment comes. You really think these people are stupid and fools. All they need is for their brothers to get something out of their destroyed properties and have nothing to do with Zimbabwe any more. I bet a million if you will get meaningful investment from Europe in a Century. They really knows how Zanu PF operate. How can they be fools to forget that it is the same government which caused farm invasions which is now talking about compensation to lure them to invest again and later to lose again. Nxaaa! !